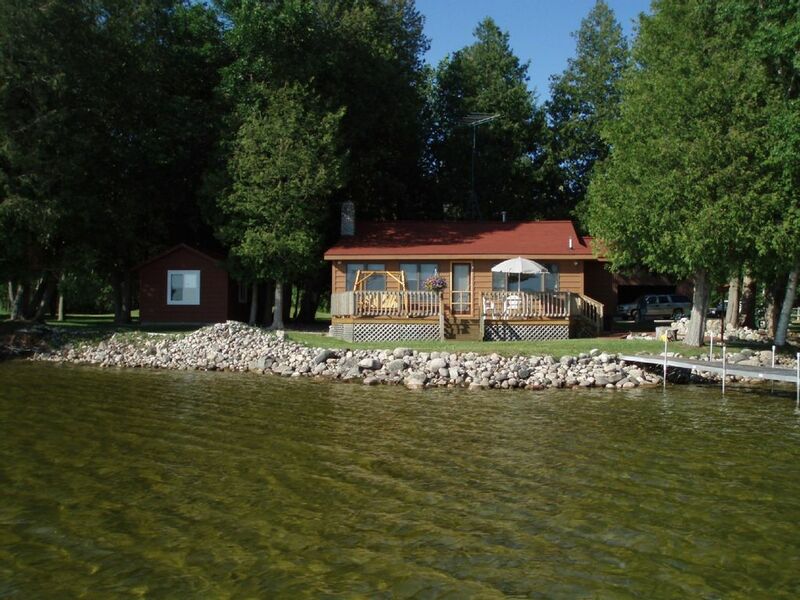 Private lakefront cottage on secluded 10,000 acre all sports lake. Great fishing, swimming, boating. All terrain vehicle riding, bike trails, marked and groomed snowmobile and x country ski trails at your doorstep. Large yard with fire pit. Across from Black Mtn recreational area. 20 minutes to Mackinaw City. 1 hour from 3 ski resorts. Main house sleeps 6, Guest cottage sleeps 2 at an additional Fee. Guest cottage has queen bed and full bath. Property is on 4 wooded acres and 210' of private frontage. Amenities: All modern amenities, fully equipped kitchen, dishwasher, microwave, toaster, coffee maker, stove and oven, fireplace, washer and dryer, radio, Compact disc player, Television, Video cassette recorder, phone, games, books, iron, ironing board, grill, bed and bath linens, deck. Main house sleeps 6, 2 bedrooms 1 bath. Guest cottage on property will sleep additional 2 people 1 bedroom 1 bath for extra fee. Activities:Swimming, boating, waterskiing, fishing, canoeing, golfing, snowmobiling, x country skiing, biking and hiking. We have stayed At this Black Lake cottage for several years now and it seems to get better each year! The privacy of the acreage which the cabin is located on is unique and makes for a peaceful retreat. The water is crystal clear, shallow and great for swimming of all ages. The lake is never busy so we enjoy water sports, swimming and fishing anytime. The cottage is very clean, well maintained, equipped with all modern conveniences that you would need. We had family stay with us in the guest cottage and it was gorgeous inside and its a nice option to expand the capacity of the 2 bedroom main house. The owners, Myra and Bert are excellent to work with and very the time if an issue arises. Great place for lake fun, ATV riding, awesome trails, and relaxing. This is such a wonderful comfortable place, this will be the third summer we are staying here-the owner Myra has always been great to work with. The cottage itself has everything we need, all the modern conveniences with lots of storage, and has always been super clean. The private setting of the cottage offers peace and quiet from our busy lives and the added entertainment in the form of ducks, hummingbirds, frogs, and other critters. There's so much lake frontage to enjoy and is ideal for just sitting in the water and enjoying the day. The lake is large enough that boat traffic isn't a problem and we caught fish without putting in much effort. The boat ride around the lake and down the Black River is very relaxing. Nearby is a converted rail-to-trail that runs along Mullet Lake for bike riding and the Black Mountain recreational area has hiking trails. Cheboygan is just a short drive away for groceries, dining, and exploring Lake Huron. I would recommend this cottage to anyone who is looking for comfort and privacy, yet desires to be close enough to restaurants, shopping, and recreational opportunities. We've vacationed in northeast Michigan for many years now and this is truly one of the best cottages we've stayed in. Beautiful Place, Inside and Out! We spent a very relaxing 5 days at this beautiful rental on Black Lake. The grounds are wonderfully kept, and the water is clear and shallow for yards and yards from shore. The cabin is very clean and contains everything you could possibly need. My husband and son had a great time riding the trails on their ATV's. The owners are very nice to work with and we definitely plan on returning for another vacation, maybe in the fall. My brothers and I had been staying on Mullet Lake for the past few years and wanted to try a new fishing spot. The cabin is immaculate in comparison to what we are used to. We were actually afraid to go inside. Well maintained with a large lot. The one bedroom has a queen bed (I think) and the other has bunk beds. There is a futon bedin the porch area and a couch that I think folds out but we were so tired, it never was opened. The lake is very shallow around the edge but there is good fishing if you know where to look. There are trails at the end of the driveway for ATV's and motorcycles. We even got within 100 yards of a pair of Bald Eagles. Overall we had a great time. Myself and some friends stayed in Myra's place and it was the most well kept and charming northern cabin that any of us had ever seen. We all hunt and fish all over the state from Houghton to Hillsdale and we all agreed this trip was the best. $800-$1275 week A $75.00 cleaning fee and $300.00 refundable security deposit. Deposit of 250.00 will reserve your week. Balance due 30 days prior to check-in. Additional guest house available for $400.00 during summer season. Balance due 30 days prior to check-in.